However, this definition that does not focus on Jupiter excludes objects such as (127546) 2002 XU93, 2003 WG166, and 2004 DA62. Using the Tisserand's parameter with respect to Jupiter of 2 or less, there are currently 155 damocloid candidates. Of these objects, 122 have orbital observation arcs greater than 30 days providing reasonably decent orbits. Their average radius is eight kilometers assuming an albedo of 0.04. The albedos of four damocloids have been measured, and they are among the darkest objects known in the Solar System. Damocloids are reddish in color, but not as red as many Kuiper-belt objects or centaurs. Other damocloids include: 2013 BL76, 2012 DR30, 2008 KV42, (65407) 2002 RP120, and 20461 Dioretsa. Retrograde objects such as Halley's Comet and damocloid (343158) 2009 HC82 can have relative velocities to Earth of 81 km/s (290,000 km/h). 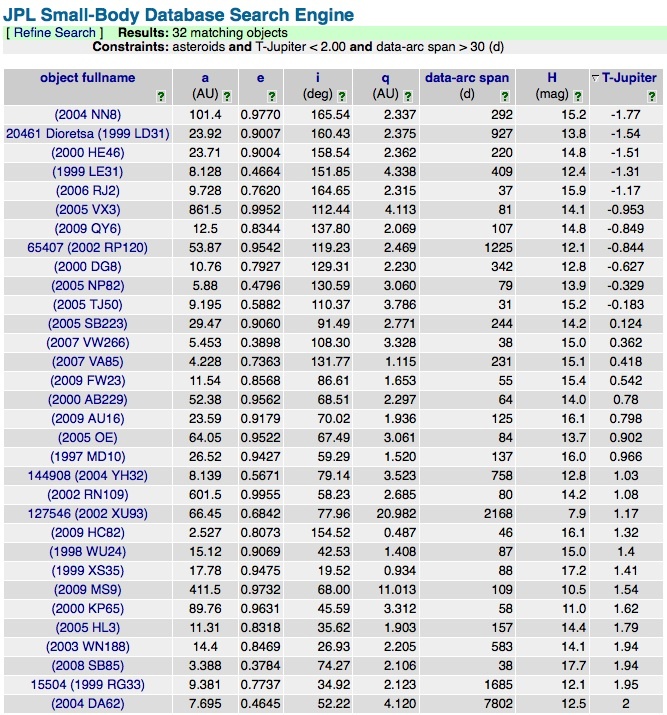 This is a list of 17 numbered and 132 unnumbered bodies from the JPL SBDB as of November 2018, that meet Akimasa Nakamura's criteria for being classified as a damocloid, that is, either a retrograde orbit, or the following orbital elements: q < 5.2 AU, a > 8.0 AU, and e > 0.75 (also see § top). Tisserand's parameter with respect to Jupiter (TJupiter) is also given. Akimasa Nakamura's criteria and a TJupiter of less than 2 are largely equivalent as only a few listed bodies do not meet the defined TJupiter threshold. Most damocloids are also listed on MPC's list of other unusual minor planets. The orbital data is sourced from JPL numbered and unnumbered element files, and excludes comets and hyperbolic bodies such as ʻOumuamua. ^ Akimasa Nakamura and bas (2 May 2009). "List of Damocloids (Oort cloud asteroids)". Lowell Observatory. Retrieved 15 February 2017. ^ Jewitt, David (2005). "A first look at the Damocloids" (PDF). The Astronomical Journal. 129 (1): 530–538. Bibcode:2005AJ....129..530J. doi:10.1086/426328. Retrieved 13 February 2011. ^ "JPL Small-Body Database Search Engine: asteroids and T-Jupiter <= 2 and data-arc span > 30 (d)". JPL Solar System Dynamics. Retrieved 7 November 2017. ^ "List Of Other Unusual Objects". Minor Planet Center. Retrieved 14 November 2018. This page was last edited on 3 March 2019, at 18:39 (UTC).